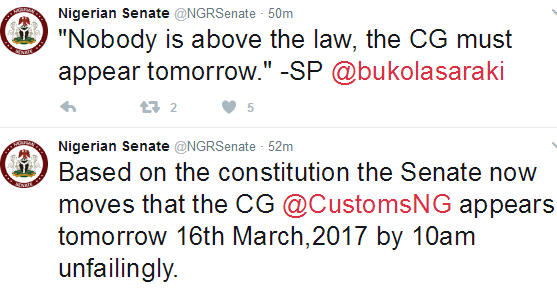 Comptroller General of the Nigeria Customs Service, Hameed Ali, failed to appear before the senate today. He had already written a letter to the senate notifying them of his unavailability for today's appearance as he would be attending the NCSC meeting. The senate in its deliberation this morning, mandated him to appear before the house unfailingly tomorrow March 16th. The senate is demanding for him to appear before the house to explain the controversial new motor duty policy.